New York, NY: Tor Books, 2003; $17.95 hardcover; 208 pp. This review originally appeared in the December 2003 issue (#184) of The New York Review of Science Fiction. The Ender universe, hereon referred to as the Enderverse, seems irresistible to both creator Orson Scott Card and its many fans. At this point, Card has written seven novels in the universe, each a bestseller. Along the way, Hollywood has flirted with the idea of turning Ender’s Game, the first of the Ender novels and an expansion of the “Ender’s Game” novella, into a movie; a recent announcement on Hatrack River (Card’s official Web Site) stated that “Warner Brothers also recently announced that it has made a deal for director Wolfgang Petersen.” In addition, last year Card released through Subterranean Press First Meetings: Three Stories from the Enderverse, a self-explanatory collection of novellas. Most recently, he has added another novella to the saga and has reissued the collection through Tor Books as First Meetings in the Enderverse. This edition is marketed for the “young adult” audience. I very rarely read books targeted for children of any age, so based solely on this book, marketing directors apparently believe that bigger fonts and larger spacing are necessary to entice juveniles into reading. Interestingly, I don’t recall needing those incentives to read when I was a teenager. As part of the packaging, Craig Phillips was commissioned to supply a number of illustrations for the book. I found the slightly exaggerated comic-book styled illustrations, some of which border on Japanese animation in their feel and are drawn in a manner that begs you to examine them, more distracting than anything else. I believe it’s safe to say at this point that it would be difficult to find an SF fan who hasn’t encountered the story of Andrew (“Ender”) Wiggin. However, for those who haven’t, Ender was enrolled by the Terran government (the Hegemony) to study at the Battle School in order to train him to take part in the war against the Buggers; humankind had already been in two violent encounters with the alien species, and the Hegemony feared they would annihilate the human race in the next war. Ender, a prodigy who completes Battle School faster than anyone before him, ultimately and unknowingly leads the human forces into battle and defeats the Buggers. In doing so he commits xenocide, virtually destroying the entire Bugger race. Eventually, he becomes a pariah for his crime, one he was unaware he’d committed at the time, and dedicates his life to atoning for his sin. The stories in First Meetings chronicle events leading up to young Ender Wiggin’s stay at the Battle School and an event shortly after his transformation from savior of the human race to Ender the Xenocide. When reading the collection, one must fight the impulse to read this as a fix-up novel. It seems almost natural to do so, as the four stories are presented in chronological order, and they cover a relatively brief subjective period in time. However, the main problem with attempting such a reading is that the gaps in the narrative ultimately leave you yearning to have additional questions answered, questions that this presentation raises but does not answer. This is illustrated most clearly by “Polish Boy.” This story, the first in the book, tells how John Paul Wieczorek (Ender’s father) first catches the eye of the Hegemony during their efforts to find children for the Battle School. His parents, Polish Catholics who refuse to comply with the Hegemony’s decree that no one should have more than two children, are suffering under sanctions that leave them barely able to support themselves and having to home-school their five children. As the story develops, the Hegemony eventually decides to negotiate with the brilliant five-year-old John Paul, making a deal that sends his family to America, where they will suffer less for their noncompliance. However, John Paul easily can (and will) maneuver out of the deal, and the ending makes it clear that John Paul will eventually pay some sort of price for his Faustian bargain. “Yes they could,” he said thoughtfully. So, given that one cannot read this as a fix-up, despite the urge to do so, how do the individual stories hold up? When he was regularly writing short stories and novellas, Card showed a wonderful talent for producing them. His 1990 collection Maps in a Mirror showcased most of his shorter work, and it demonstrates his knowledge of what makes a short story work. However, based solely on the stories in First Meetings, three of which were written in the past five years, those skills seem to have gotten somewhat rusty. As the origin of the whole Enderverse, “Ender’s Game” continues to be the strongest link. Everything that made the story so compelling when it was written 25 years ago still applies. The dehumanization by the military of its too-young recruits; the unfolding horror of child abuse inflicted upon Ender at Battle School and Command School in the name of saving the species; the willingness of the military to inflict damage upon a child rather than an adult just because the child might be more able to recover from it; the almost cavalier attitude to the signs that young Ender is becoming more mentally unstable as a result of his ordeal–all these elements still retain a striking power. As sometimes happens to genre literature, public events after the publication of “Ender’s Game” gave the story an eerie prescience. After hearing American military commanders during the first Gulf War exclaim that they were looking forward to commanding the first generation of pilots and soldiers weaned on violent video games, the conceit that teenagers could one day pilot our high-tech machinery into battle suddenly seemed much more plausible. The remaining three tales show varying degrees of strength. In “Polish Boy,” while John Paul appears to have found a way to help his family, it’s obvious that the Hegemony intends to exact its price later. Indeed, readers familiar with the Enderverse know the fate that waits for John Paul’s children, and see that while he wins this battle, his family will eventually lose its battle with the Hegemony. As a result, “Polish Boy” portrays a parallelism in the lives of Ender and his father. Both are wildly manipulated by the military, and both will suffer in one form or another as a result of that manipulation. Knowing all that, it’s hard not to experience a palpable feeling of dread as the story closes with Captain Rudolf Graft insisting that he has set a trap from which John Paul cannot escape. “Polish Boy” is followed by the weakest story in the collection, “Teacher’s Pest.” As stated before, this story tells of the meeting of Ender’s parents. In it, we see that John Paul Wiggins has grmvn into an incredibly smart and cunning individual. So too is Theresa Brown, a graduate student who is teaching a course required for him to graduate from college, and the woman he falls for very quickly. Card does a wonderful job of painting them as kindred spirits and getting you to believe they could fall for each other so readily. Yet, their dismissals of the notion that the military is attempting a “eugenics program” seem a little too nonchalant. While true love can cause irrational behavior, given the type of perception and insight he previously showed, it’s hard to believe that John Paul can ignore the notion of Hegemony interference so quickly. The same goes for Theresa, whose personal life the Hegemony has manipulated very recently. Furthermore, while it makes sense that Ender would have such intelligent parents, it doesn’t quite fit with what we see of them in the Ender’s Game novel, where they appear somewhat obtuse and not fully cognizant of what exactly the Battle School is doing to their child. The differences in characterization are disconcerting. The collection closes with “Investment Counselor,” which tells how Ender first encountered Jane, the A.I. who handles his finances and assists him in his research and travels. The story, for the most part, is of interest only if you’ve read the later Ender novels, as Jane was a later addition to the saga. However, the story does show how Ender finds his new calling and transforms into the “Speaker for the Dead.” As if in keeping with a theme of loose threads, portions of the story raise unanswered questions–most specifically, who exactly sent Jane to Ender. Given the pervasive military oversight over his life, that would seem to be the easy answer. Yet Jane is unable to divulge that information to Ender when he directly asks her who sent her, thus leaving some doubt as to the answer of that question. Not knowing the author’s intent, it seems that First Meetings is mostly an attempt to entice new readers into the Enderverse. The number of unanswered questions and loose threads suggest an attempt to seduce the uninitiated into exploring the Ender saga even further. However, as part of an introduction to the Enderverse, “Investment Counselor” is slightly ill-fitting. 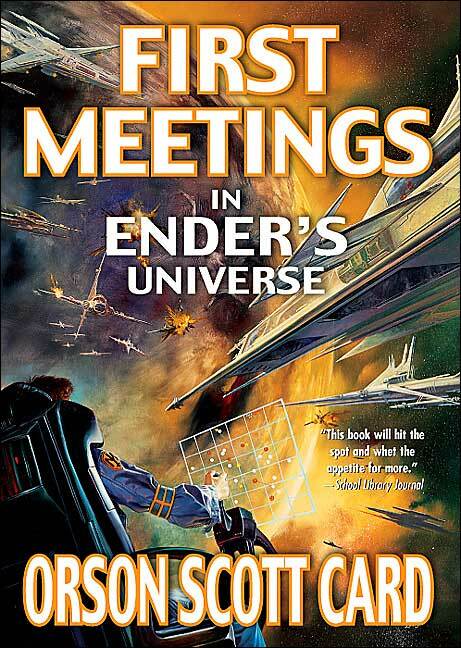 While the story is enjoyable does function within the framework of the collection in that it describes the first meeting of Jane and Ender–as well as showing Jane’s entry into the Enderverse–it is relatively weak and of most interest to those who have already read the later Ender novels. Experienced readers will enjoy probably it more than those meeting Jane for the first time. That aside, as an introduction to the Enderverse, First Meetings is sure to bring in its fair share of neophytes to the saga of Ender Wiggin and those around him. This entry was posted in Book Review, Matthew Appleton, Orson Scott Card. Bookmark the permalink.